I returned to B.K. Leach Conservation Area on Tuesday to try to find the snowy owl I had located Saturday but it was nowhere to be found. I stuck around for several hours before I finally spotted the owl on a telephone pole about 3/4 mile away. I watched through my binoculars as the snowy flew to a tree even farther away and stayed there for another hour. Finally, I gave up hope that the arctic visitor would fly to my location so I packed up my gear. All wasn’t lost as I met another photographer, Stephanie, and we spent the morning sharing stories about birds and other critters we have met along the way. I arrived at the area just as the horizon was bisecting the sun. The wetland was bathed in pink, with just enough light for an image if one presented itself. I looked around, only slightly optimistic, and the snowy was nowhere to be found — again! I had already assembled my camera, lens, and tripod, and I was pulling on my Muck boots when I took a second look around. 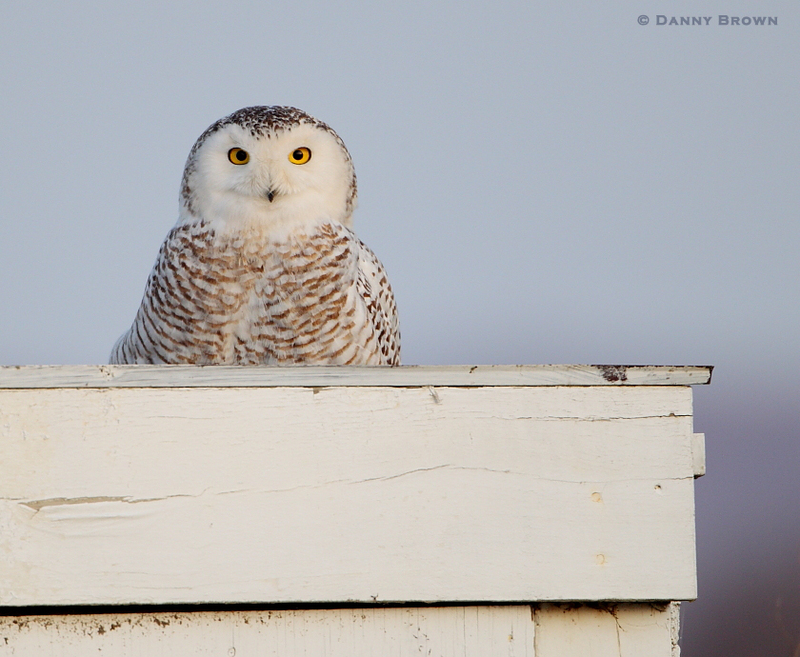 Somehow I had missed a telephone pole on which the gorgeous snowy owl sat perched in the sunrise glow. I tried to be as nonchalant as possible, an anthropomorphic technique I often deploy that is likely useless, as I finished donning my boots. When I finally looked up again at the top of the telephone pole, the owl was still there, scanning the horizon. I didn’t want another image of the wintry owl on a telephone pole, so I sat down in my portable director’s chair that I keep in my car, and waited for the snowy’s next move. I only had to wait about 10 seconds before it dropped from its perch and grabbed an American coot in the wetland. Fortunately, the coot’s death screams only lasted a moment. As I situated myself between the sun and the snowy, I thought, “This is it big boy; don’t blow it!” The featured image was the result, taken from a considerable and considerate distance with a 700 mm lens, so as not to disturb the fierce predator from the north. After the snowy ripped a few morsels from its breakfast, it lifted off into the wind and carried the coot away. I watched as it touched down almost a mile away on the other side of the wetland. I packed up my gear and began thinking about a little breakfast myself, something better than coot, I hoped. I was too eager to get home and review the images to stick around any longer. A final image from my time photographing “Joan Snow” from the arctic. I probably won’t make it up to B.K. Leach again before the snowy skedaddles for the season. Maybe next winter, she’ll be back down. I hope she brings her boyfriend. “Snowy skedaddles for the season”…loved the alliteration as much as the images :D.
Well worth the trip back and all the waiting involved. Beautiful! 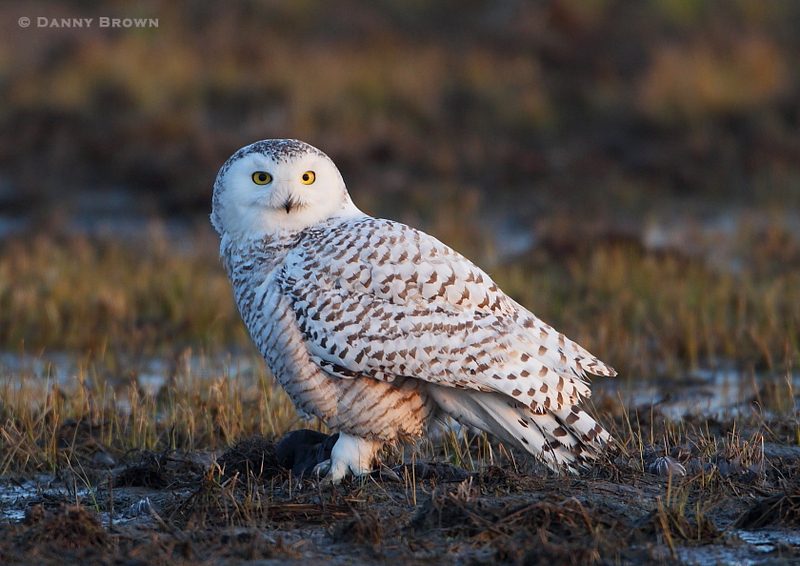 Danny, thanks for getting out of bed at 4:30AM to capture these beautiful images of the gorgeous snowy owl. Captivating story, stunning images! The man ☺ persistence always pays off. Well done Danny.